1. Dice peeled potatoes into small chunks and add to boiling salted water. Boil for 15-20 minutes or until potatoes are soft all the way through. Drain then return potatoes to pot. 2. Add butter then milk. Gently stir together until you get a soupy consistency. Add sea salt and pepper to taste. 3. Spoon potato soup into a bowl and add toppings of your choice. Why this easy baked potato soup recipe is the best! Guys, I’m going to be honest. There are a bunch of other recipes for loaded baked potato soup out there. 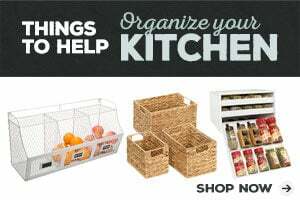 Some call for onions, flour, chicken broth, and all this extra stuff…. I even saw a recipe that has you baking the potatoes first then adding them to the soup. You don’t need to do all that! This is one of those keep-it-simple recipes. In fact, I think the simplicity of its flavor is what I enjoy about this soup so much. Think about it. A loaded baked potato is just a potato and some toppings. Pretty much the same thing with this soup. The base for this soup is simply a potato cooked and made creamy. It’s so easy it’s almost too good to be true and that’s when you know you’ve stumbled upon a recipe gem. This soup is all about the toppings. Bacon being a main ingredient to add more depth of flavor. Bacon can be expensive so when I find it for a good price, I buy it and freeze it. Since typically we keep our bacon frozen, what I do is open the package of bacon, and place the entire frozen chunk onto a baking sheet and put it in the oven while its pre-heating. I leave it for about 7-10 minutes. Then I take it out and carefully separate each piece (watch the hot pan people! ), spread the pieces out on the baking sheet and cook the bacon in the oven for another 10-15 minutes depending on how thick the bacon is or how crispy I want it.You can crumble it with your hand when it gets really crispy or use a knife to chop it into bits. This loaded potato soup makes for a great weeknight meal. Why? Well, there are very few ingredients needed, no defrosting required, everything cooks in about 20 minutes, and all you need to make this next level is to secure some good quality potatoes and toppings. So, what toppings go best with this potato soup? Cheddar cheese – fresh grated. Did you know pre-shredded cheese has a powdery coating to prevent it from sticking together? It does. And that prevents the cheese from melting as well as it should. It also has a little hint of a powdery taste. If you have time, go natural. Get a block of cheddar and give it a quick shred. If your kids are older and you trust them around blades 😬 this is something they can do. Use you decriction of course. You can also use a food processor to quickly shred cheese (and without shredding your fingers too!). Sour cream – a very small dollop goes a lot way to enhance the overall flavor of this soup. Chives – fresh or dried depending on what you have available. Green onions are also yummy. Roasted corn or chopped broccoli – either one of these would be a yummy addition! What type of potatoes are best to use in potato soup? Yukon Golds – these are good all-purpose potatoes with a lot of flavor. They are starchy but also hold their shape fairly well. This would be my ideal choice for potato soup. Russet potatoes – these absorb liquids and are pretty starchy so they don’t hold their shape well. They can also become glue-like if you overcook them so be cautious. They will give you a thicker, less chunky soup overall due to their starchy quality. Maybe you’d like that? If you think so, go for it! Red potatoes – I really like the flavor of red potatoes and they hold their shape well. You can also eat their peel since it’s softer than a regular potato. Great if you’re feeling lazy and don’t mind the skins showing up in your soup. Sweet potato – you could also use the potato’s sweeter, more orange friend! 🙂 Of course, this will give you a completely different, sweeter overall flavor, but you may just love that. Experiment and see what you like best! What’s the best way to cook this potato soup? I prefer to just make this on the stove top using my dutch oven. You could make this in the crockpot. Just increase cook time to 1 hour on high or 2 hours on low and check for doneness of the potatoes. I usually do this by carefully pulling out a large chunk of potato and seeing if it’s soft all the way through. 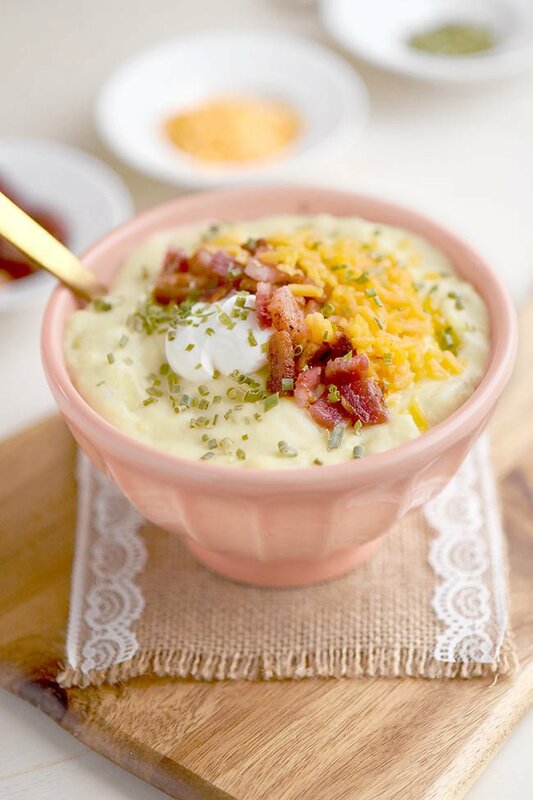 This easy loaded potato soup recipe was featured on Wow Me Wednesday and Menu Plan Monday!